This a quick, simple, and savory recipe from Puglia that uses one of winter’s fresh veggies in a new way. In Puglia, orecchiette (“little ears”) pasta with cime di rapa, anchovies, and hot pepper is very popular (cime di rapa is similar to broccoli raab in bitterness and taste, but they’re different). Using broccoli in place of the cime di rapa makes this a quick dish with ingredients that are readily available practically anywhere, all year round. Broccoli seems to be something I come back to a lot in the winter. The dish has become a Pugliese favorite in its own right, using broccoli instead of cime di rapa. This recipe shows how easily Italians use just a few ingredients to create delicious food. It’s a filling pasta, but not heavy; and sometimes I crave this as much as I want a richer plate of pasta alla carbonara. Use anchovies conserved in salt whenever you can; they last a long time and won’t go rancid, as the oil can sometimes do in oil-packed anchovies. Cauliflowers, broccoli, green beans are generally cooked through. Italians are not big fans of the “green” flavor of these vegetables. 1) Cut the broccoli into bite-sized pieces and boil in salted water. Remove the broccoli but do not discard the water. Cook the broccoli until quite well-done, about 10 minutes; it will break apart and form a sort of sauce if not too al dente. 2) Boil the pasta in the broccoli water, adding more water if necessary. 3) While the pasta is boiling, mince the garlic and chop up the anchovies. Sauté in olive oil, smashing the anchovies with a wooden spoon until it forms a paste. Toss in the broccoli and hot pepper and mix well. 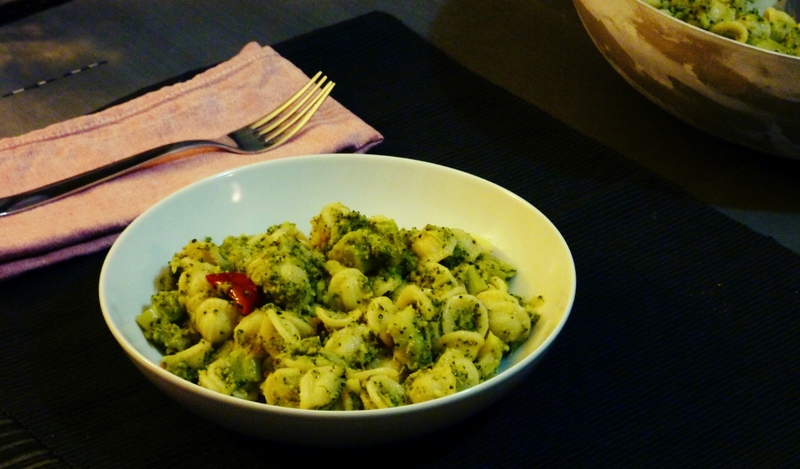 4) When the pasta is cooked al dente, add it to the broccoli mix and serve. Note: To be a genuinely Italian dish, don’t add cheese to your plate! I know, it’s tempting…but try it without first (and give yourself a couple of bites to get used to it). The anchovies and hot pepper give it savoriness and saltiness, and the cheese just adds something that isn’t needed. At least, according to the Italians. This is part of my Italian Pasta Journey. I want to explore Italy by way of its huge variety of traditional pasta dishes. Check out my post and the other recipes as I add them. turinmamma took the words out of my mouth – one of my favorite pasta dishes ever (with cime di rapa). And of course excellent with broccoli as well. I think I used a splash of milk with a spoonful of ricotta in place of the cream. Hi Diana, thanks for your visit on Papricannelle! I am discovering your blog, and being a huge Italy fan, I am thoroughly enjoying it!! Cheers!